It is a shame that Hillary is using the Baltimore tragedy to pander for votes. This is just one more signal that this woman has no shame. Her Democratic Party has turned Baltimore into a jungle and she just doesn’t let up. Even when the city is down on the ground groping for air she has no mercy – she continues to beat the drums of hate and division. Republican Rep. Pete King has slammed Democratic presidential contender Hillary Clinton’s criticism of race relations as she condemned a criminal justice system that she claims targets black communities. A Thug is a thug……period, it isn’t the N-word as a city councilman in Baltimore claims it to be. A thug is a single word that describes a persons action against its community, like looters, arsonists etc. etc. etc. Here we go again……political correctness crap. If you knock out a window intentionally, you are acting like a thug. You loot, you are a thug. Destroy property, THUG. There are other words we could use, idiot, moron, social animal……on and on. If you behave consistently in a manner of destruction, you are a THUG. Don’t act offended when you act offensively, it is what it is, and if you behave in a way that merits a one word description, you might be a THUG. As documented here on several occasions of late, there are new questions surrounding charitable contributions to the Clinton Foundation. Most notably, a Reuters investigation revealed that the Clinton family charities may have suffered what we called a “Geithner moment” when they failed to report tens of millions in contributions from foreign governments on tax documents. The foundation will now refile five years worth of returns and hasn’t ruled out the possibility that it may need to amend returns dating back some 15 years. This prompted acting CEO Maura Pally to pen a lengthy blog post in which she explains the “mistakes” and attempts to reassure the public that the Clinton Foundation is taking special care to guard against “conflicts of interest” as Hillary begins her run for The White House. Pally also notes that similar measures were taken when Clinton was Secretary of State although, as we noted, the charity accepted donations from the likes of Kuwait, Qatar and Oman while she was the nation’s top diplomat. Goldman Sachs paid former President Bill Clinton $200,000 to deliver a speech in the spring of 2011, several months before the investment banking giant began lobbying the State Department, then headed by Hillary Clinton, federal records reviewed by International Business Times show. In recent days, attention to overlapping interests that have donated to the Clinton family’s private interests while also allegedly seeking to influence State Department policy has reached a fever pitch amid leaks from a forthcoming book on the subject, “Clinton Cash,” by Peter Schweizer. State Department records show that Bill Clinton’s $200,000 Goldman Sachs speech was delivered April 11, 2011, to “approximately 250 high level clients and investors” at a United Nations dining room in New York. In federal disclosure documents, the Duberstein Group is listed as lobbying the Clinton State Department on behalf of Goldman Sachs between July and September 2011. Goldman Sachs paid the Duberstein Group $100,000 during that time. Those records show that the firm was specifically lobbying the department on “proposed legislation” linked to a series of budget bills. One bill continued congressional authorization for the Export-Import Bank, a government-backed lender whose financing was critical for the prospects of a company in which Goldman owned a stake. The original budget bill was introduced in July and did not include an extension of the Export-Import Bank, but the bank reauthorization was added in late September, during the same period Goldman was lobbying the State Department on the bill. In August 2011, the bank authorized a $75 million loan enabling a Chinese firm to purchase aircraft from Beechcraft (known before emerging from bankruptcy in February 2013 as Hawker Beechcraft), a company that was part-owned by Goldman. Beechcraft had lobbied the Clinton State Department on issues relating to foreign military sales in 2009 and 2010, according to its lobbying disclosures. Readers can draw their own conclusions here, and we don’t think it’s any surprise that Wall Street lobbyists wield considerable power in Washington, but the takeaway is that, as we’ve said on a number of occasions recently, you can expect to learn much, much more in the coming months about the degree to which the Clinton Foundation — and any other avenue through which foreign governments, Vampire squids, and a whole host of other state and non-state actors can channel money — is used as a means of buying influence with America’s maybe next President. Clinton proposal? Who does she think she is, oh I know Hillary Clinton. So, now she is proposing a constitutional amendment that would keep publishers, authors from publishing books that criticize candidates. A book such as “Clinton Cash” that exposes the corruption of the Clinton’s. This is censorship, ripping us of our freedom of speech. This proves Hillary Clinton is a socialist, that will go to any extent to cover-up her’s and Bill’s corruption. Pure arrogance. They say they are protesting in Ferguson in support of the protests in Baltimore. Lets call it what it is “The continuation of unlawfulness by idiots in a high crime area”. The pretentious protesters in Ferguson are only using the riots of Baltimore as a lame excuse. Shots were fired, and at least one man was wounded. These people have no cause except to act in a way that is already character within them. It has become difficult to find new words to describe what is repeatedly happening in Ferguson. As Hillary would say “It’s old news.” It is the norm in Ferguson, and yes it now defines them. When outsiders hear the name “Ferguson” what do they associate it with? Violence and rioting, unlawfulness, that is Ferguson. The only words I have, Ferguson, it’s the same old crap. Hillary Clinton Hasn’t Paid Income Taxes In Ten Years! It wouldn’t be shocking! She is certainly arrogant and CROOKED enough. This woman makes Nixon look like a Saint. There is an original idea. 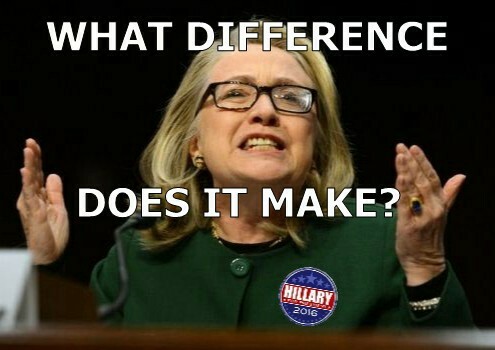 Hillary coming to our rescue with an answer that has only been debated for about a year now.